Arequipa is the second largest city in Peru, yet it manages to maintain the feel of a much smaller place. The Plaza de Armas in the center of the tourist zone was one of our favorite spots in all of Peru for people watching. The square is very well maintained with a beautiful fountain and plenty of trees and benches. 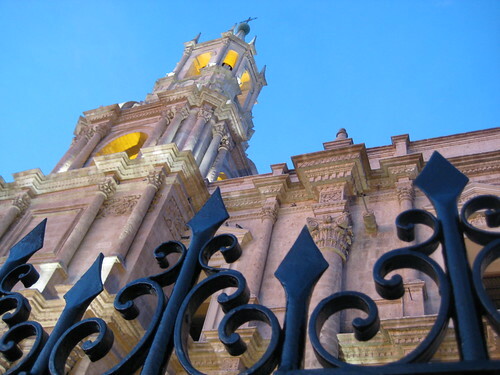 One entire block on the edge of the plaza is taken up by a spectacular cathedral. We snapped this shot just as the sun was going down and the first of the lights illuminating the cathedral had been lit. Really like this photo! Nice catch with the fence! I always struggle to find something more interesting to capture in those church tower photos.